This is the yarn before it got plied. 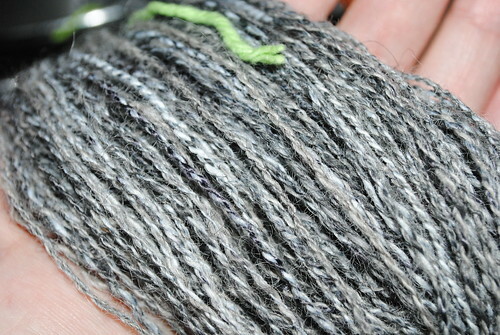 I was able to spin the whole 560 yards on this spindle, since it is a two ply, it became abour 280 something yards. I have made a skein which is the picture you see below. This picture below is before I put it in a bath of Eucalan wool Soap and some vinegar, then after that I will whack my yarn and let it dry in the bathroom until a day or so. I believe I may have enough for a pair of mittens , a hat or a small scarf. I do not have enough for a pair of socks, but if I mix another yarn, it could be a lot of fun. There will be more drop spindle spinning. I need to practice with the drop spindle. 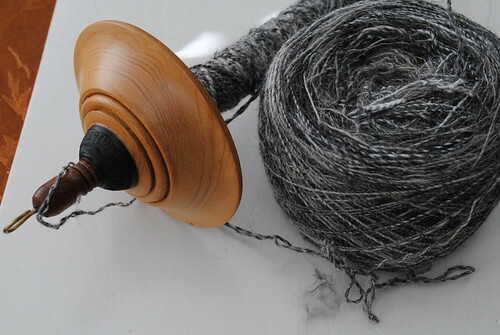 Every day is good for drop spindle , 15 minutes to 30 minutes a day. I have some nifty Alpaca and some BFL to practice later on. I hope you enjoy the yarn experienc that I am sharing and come by later on. Thanks for stopping by.